For high-performance digging, lifting and trenching at maximum reach, Bobcat backhoe loaders allow you to handle the toughest jobs with ease, whatever the application. 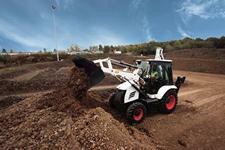 And for even more versatility, Bobcat® optional attachments help you do more with one machine. Bobcat® B730 is powered by a 100 hp turbocharged engine, driven through a standard powershift transmission, and controlled by mechanical levers. This model is equipped with 2-wheel steer and 18" front tyres. Double loader bucket cylinders give you superior breakout force and reduce maintenance costs thanks to the bolt-type cylinder head design. Bobcat® B750 is powered by a 100 hp turbocharged engine, driven through a standard powershift transmission, and controlled by hydraulic joysticks. This model is equipped with 2-wheel steer and 20" front tyres. Double loader bucket cylinders give you superior breakout force and reduce maintenance costs thanks to the bolt-type cylinder head design.